Taco night seems like an American institution. Not only is it a cheap and easy way for mom to feed the kids, but lets be honest - who doesn't love tacos? Tacos can be done many ways, and there's plent of crafty gourmet recipes using new and fresh ingredients available that are a far cry from a pound of ground beef and a seasoning packet. Some nights, however, you get a craving for "bad" food, like a good old ground beef taco (which is not anything close to authentic Mexican, but we'll still categorize it so). Unfortunately, the beef is often greasy and fat & cholesterol laden, and the taco seasoning is full of sodium. This recipe offers a healthy alternative that will be approved by the picky crowds. Ground turkey, because it is so lean, tends to be dry out and have an unfavorable texture. However, paired with these seasonings and plenty of yummy (and reduced fat) ingredients, it will easily go unnoticed. This recipe should serve about 4 hungry diners. Wine pairing with ground meat tacos is a little ironic. Wine snobs might say, why pair a nice bottle of wine with "poor man's" food, but I say why not enhance your experience. Spicy foods poses one of those unique challenges. I would definitely pair this meal with a dry riesling. Pacific Rim makes a widely available (and very affordable!) dry riesling that I love, or try a dry riesling from the Finger Lakes region in New York, where riesling is the specialty - and they do it very well. Happy pairing! 1. Combine ingredients for taco seasoning in small bowl. 2. Heat small amount of vegetable oil in large skillet over medium heat. Add ground turkey and break apart meat with spatula. Add diced bell pepper and onion. Cook until meat is no longer pink, stirring frequently. 3. Add 1/2 cup water and taco seasoning. Stir to coat evenly. Remove skillet from heat. 4. Warm tortillas according to package directions. 5. Layer ingredients - I usually spread 1 tbsp of sour cream, 1 tbsp salsa onto tortilla. 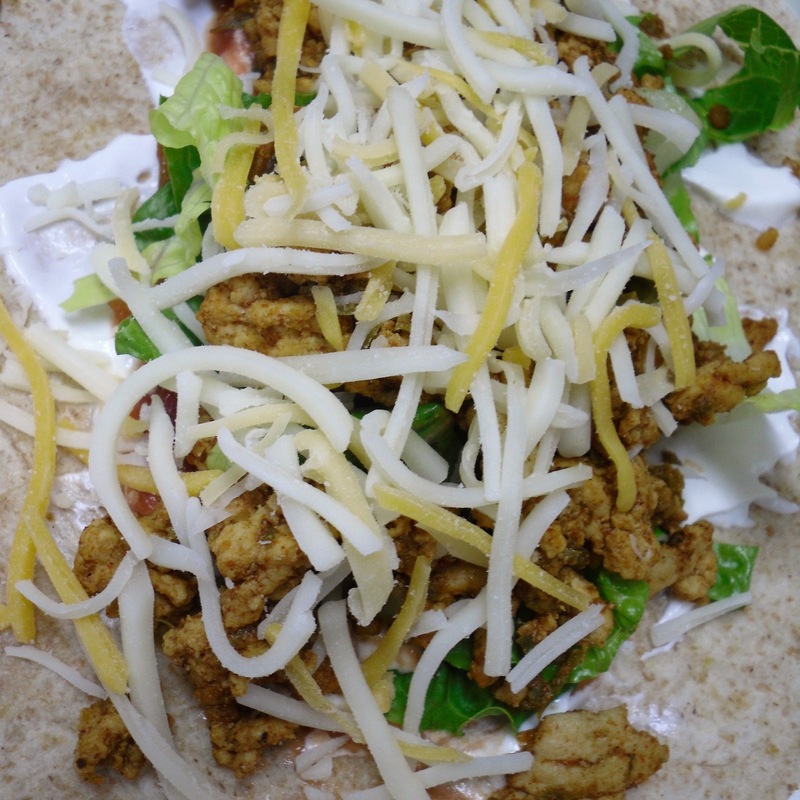 Cover with a few tablespoons shredded lettuce and tomato, then 2-3 tablespoons meat, then sprinkle 2 tablespoons cheese and jalapeno slices, if desired. 6. 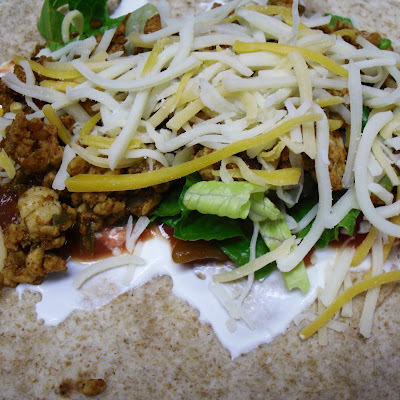 Fold in sides of tortilla, wrap tightly, and enjoy! Ah, brings me back to my childhood.﻿ Nom time.